The I Declare… game helps players become familiar with the Bill of Rights as well as many facts about United States history and geography. Ages eight and up can play together, and from two to six can play at a time. 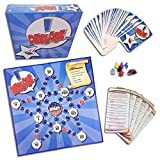 The sturdy game board comes with a deck of over 200 cards, six Article Score Boards, pawns, markers for the score boards, one die, and brief instructions. Players can move any direction on the multi-path board since their goal is to land on spaces for each of the ten articles of the Bill of Rights. Article Score Boards list each article with a brief summary. Each article also has an action such as “You must speak in a funny voice.” “You must remain standing until your next turn,” or “You lose your next turn.” If a player lands on that article, they need to perform the action, sometimes continuing to perform the action until they answer a question correctly on a subsequent turn. If a player fails to continue a required action, they can lose an article marker and be sent back to start. But landing on these spaces isn’t enough to win the game. The deck of cards also determines a player’s success. Cards each have true/false questions with two levels of difficulty. It seems to me that the difference in difficulty between the two levels is rather large. So it is important to decide in advance which level of difficulty to use, perhaps using the easy level for children and the harder level for teens and parents. Here’s an example from one card. The easy question says, “The state abbreviation for Indiana is _____.” Three possible responses are IN, ID, and IA. The more difficult question states, “______ took control of the Virginia colony in 1608.” The three possible answers are John Smith, John Rolfe, and Sir Walter Raleigh. Another player will read the question as a statement for the player to answer as to whether the statement is true or false. In an interesting twist, questions have three answers printed beneath--the first answer being true and the other two false. The player reading the question can choose to read the statement with any of the three answers. If the responder answers correctly he or she can then place an article marker on their Article Score Board. Although it isn’t clear from the instructions, the publisher tellls me that a question card is supposed to be used only when a player has landed on an Article space. However, I tried playing using a question card every turn and preferred that because of the educational benefit as well as the extra challenge. You can decide for yourself which way to play. Yet another bit of fun is incorporated into the game with a “List of Punishments” printed on the game board itself, “punishments” such as “Whisper while talking,” “Dance,” and “Sit on your hands.” Every player has to try to collect markers for Article VII and Article VIII. For Article VII, opponents, choose a “punishment” for you from the list, while for Article VIII, the die determines which of the six “punishments” you will incur. I like the combination of serious questions with silly actions and random game elements. The randomness coupled with the two levels of questions helps to level the playing field so that players of different ages and ability can play together. The silliness of the required actions might keep children engaged more than the challenge of acquiring markers for all ten articles on the Article Score Board. $34.95. Save 20% by using discount code CDUFFY20 through L & N Specialties' Amazon store by clicking here.